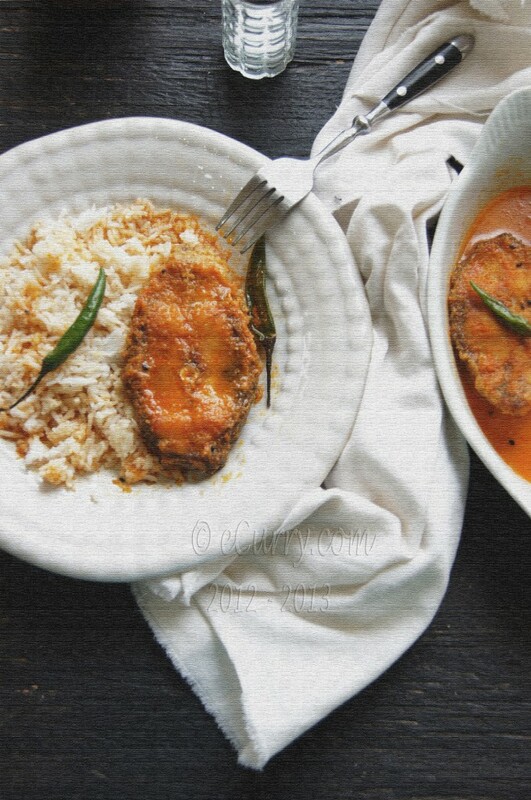 This is a very typical fish curry, laden with prominent Bengali flavors. Let me warn you here that this is going to be a LONG post. I did get carried away. To get passionate about cooking I need a trigger; and the memories trigger passion for me, the urge to cook and enjoy and I write about it as I feel that memories make food complete. You can skip all of it and move straight to the recipe if you wish to. The recipe is simple and not requiring many ingredients. The key here are the spices and they are not the very unusual ones. The styling of this photo was inspired by another photograph I had come across long time back. I could not find the creator of the photograph. However it is listed here in this Page. I am still looking for the photographer and when I find I will update the post/credit. 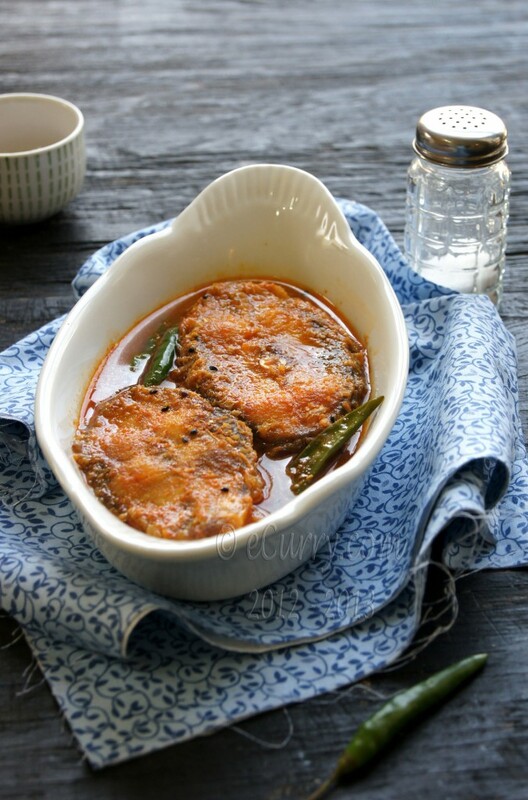 I was going over the last few posts and I realized that I posted a lot of Bengali recipes in a row, which I have never done before. It definitely was not intentional, but since I post what I cook, you can see a trend in what we have been eating. This recipe today is simple and every day kind of recipe. But what I remember every single time I make this are the special occasions at home – wedding and many more of the kind. Mind it, this dish is never ever served for the wedding feast. I need to talk more about the tradition of big occasions back home here. The family comes together long before the actual day – whatever kind the festivity might be. The few days before the final day, the activities peaks, and so does family and close friends. That calls for catering food (in recent times) or having the entire yard getting prepared for a full time team of cooks, the largest utensils and the unbelievable spread of paraphernalia. The house teems with people and it could be close to a 100 or even more, depending how big a family you have. The women of the house who are otherwise usually in charge of the kitchen have other business to do – time for them to get busy shopping, holding all acts together and also decorating themselves. The food during this time period is not fancy. It is the everyday sort of food, soothing and comforting but served in mass scale. Believe me, the entire atmosphere, the hustle and bustle and the mere enormity of it changes the taste of the food. I know it is a psychological thing, but it is true. There is a different charm to sit down in a line with the youngsters all together, then the men, and the older generation and the women all in groups, devouring hungrily and joyfully what is being served in buckets by very enthusiastic volunteers from the family. The mood is generally peaked and happy tending towards being boisterous- or it may seem that way! Sometimes some tense argument would be heard from a corner which would quickly resolve and end in full throated laughter. The children are laughing and joking and playing pranks. It is busy insanity, but a good kind. 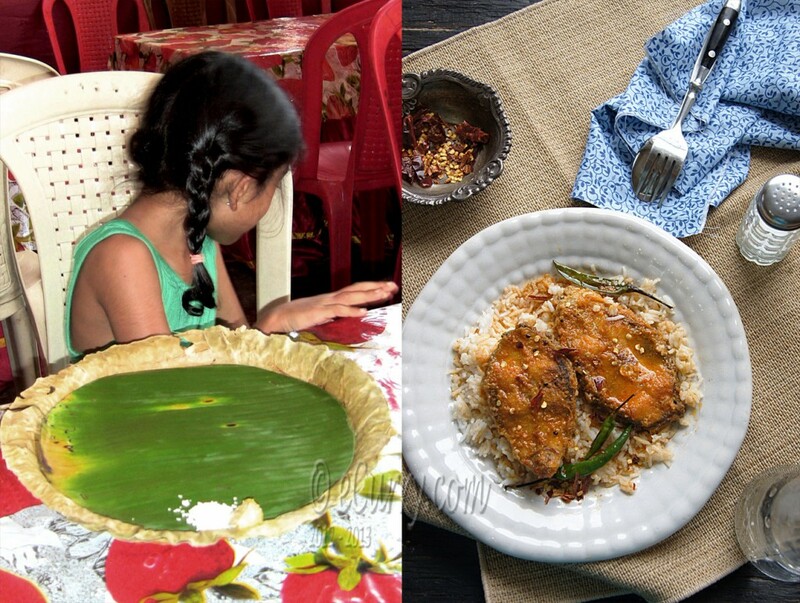 While I was growing up, food during this time was served on either banana leaves or a different kind of plate with leaves woven together – all disposable and biodegradable! The aroma of the slightly scalded banana leaves when the hot steaming food hits it holds its magic and adds to the inexplicable, and subtle satisfaction. Banana leaf plates. Last summer when we were in India, we were invited for a “feast” and thank God for the small town charm of my home, these traditions are still not yet lost. My girls experienced this kind of get together for the very first time. 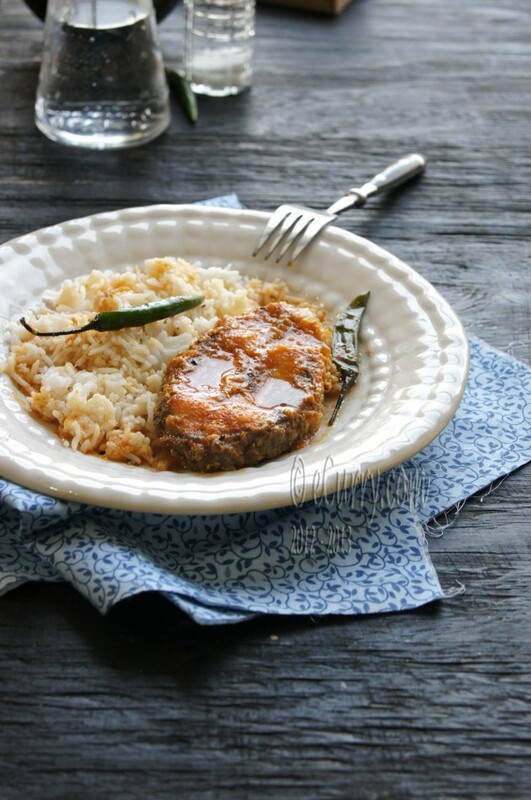 Along with the other things like Bhaja Muger Dal, Beguni, Dhoka, Bandhakopir Torkaari, and sweet Bengali Chutney and more, would be this fish curry. The funny part is when made in a mass scale like this, there was a very different way to serve it. First came the fish pieces/steaks (mind it no sauce or gravy here) then following this server was another who had the sauce in the bucket! So first the fish was placed on the plate and then the gravy was ladled over on the rice. Even though it might be the same dish, this is never how we have it at home. I remember as a child that I would sometimes ask for the sauce and sometimes refuse it, and just be happy with the fish. The trick here is to cook the fish in the sauce and then separate them. Why it is done that way, I do not know. If any one does, please let me know for I have always wondered and still do. It saddens me that all these are dying traditions now, getting lost amidst globalization. These days probably pasta and feta cheese are served for meals 🙁 It is us who are staying away from home, who remembers these times and misses them most. The present generation back home, never experienced it and it is probably just a story to them as it is to my girls. I know very well that it is not easy to relate to these feelings for those who have never known what it is like. For me however these memories are tucked in a precious place where I often reach out and re-live. Using bone in fish steak is recommended. 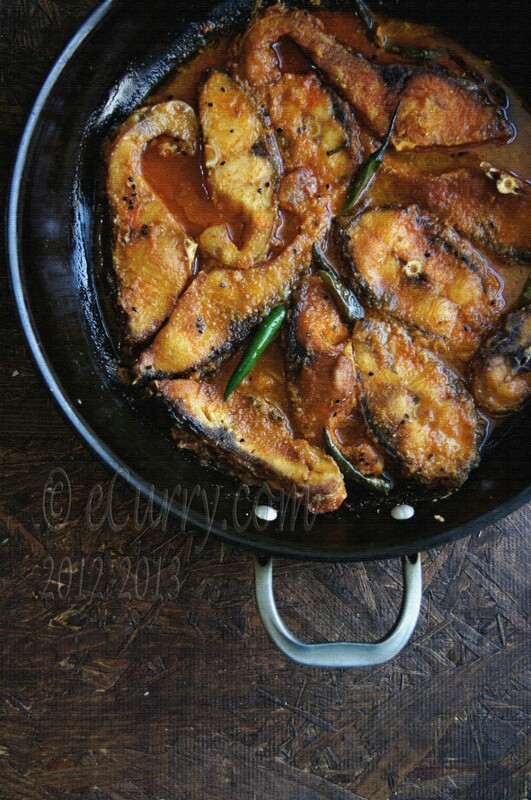 The recipe is always made with fresh water fish (not salt water/sea fish), typically like Rohu/Carp. If this kind is not available, substitute with fish of your choice. Remove scales (if it is not already done) and wash fish steaks until the water runs clear. Pat dry with paper towels. Sprinkle salt and turmeric powder on the fishes and toss well for the salt and turmeric to coat fish really well. Allow it to sit for about 15 minutes. Heat oil in a wok/kadai. The oil should be smoking hot. Carefully place steaks one by one in the hot oil in a single layer (very very important). 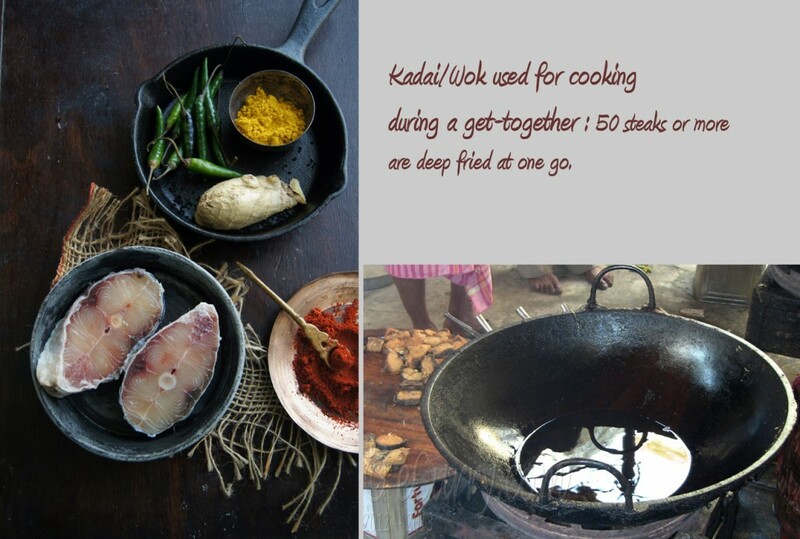 The oil should be deep enough to cover the fishes and if the pan/kadai/wok cannot hold all the steaks the first time, deep fry them in batches. Once the lower side is golden brown, flip it over (Do not force it. The steaks will release themselves when done and will flip over easily. If they do not, wait! that means they are not done yet). Repeat the same process with the other side. Remove with a slotted spoon and drain on paper towels. Make a paste with ginger and the cumin (using a mortar and pestle will do and you will not need to use any extra water. The water from fresh ginger should be enough. If you do need extra, use in small splashes). Heat the mustard oil (or any other oil you are using) in a pan/wok. When smoking hot, add the slit green chili peppers and nigella seeds. Allow the seeds to sizzle, and it will happen pretty quickly. The hot peppers will turn brownish too. Add the ginger cumin paste and stir it until aromatic, less than a minute. In a bowl take 2 cups of water (or more if you want it soupy). Add coriander powder, turmeric, chili powder and salt. Stir it well for it to combine. Pour carefully into the pan. Bring the spiced liquid to a boil and cook for about 3-5 minutes. 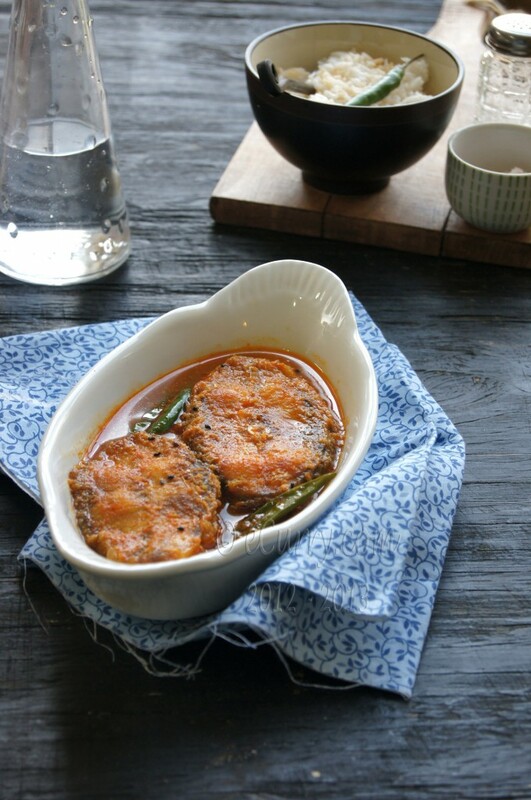 Place the fried fish steaks in a single layer, lower the heat to medium and simmer for about 10-12 minutes. Switch off the heat; cover and allow it to sit until ready to serve. You may garnish with fresh cilantro when ready to serve. Serve with steaming hot rice (the traditional way) or with bread if you wish. May 17th, 2012 | Category: Curries, Seafood, Sides & etc. 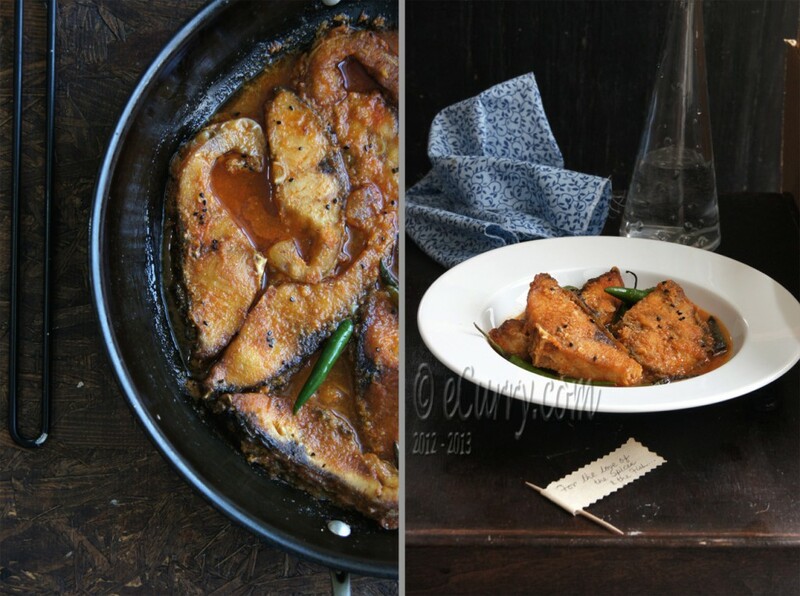 A fabulous fish dish and gorgeous clicks! 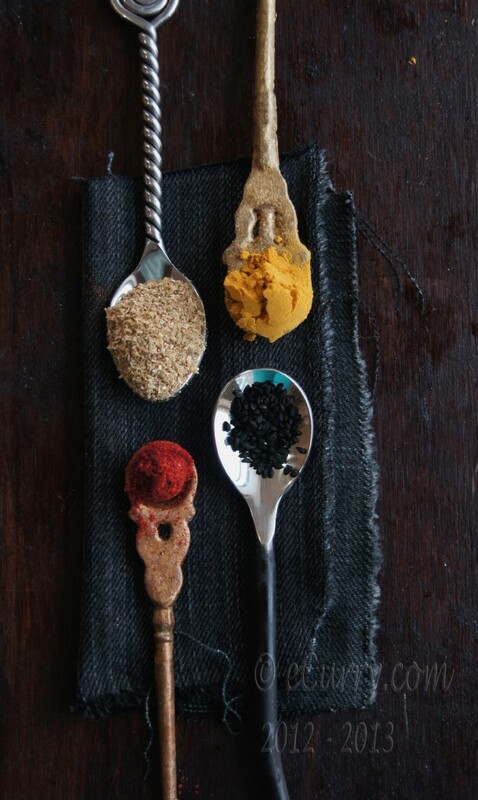 This combination of spices is just wonderful. Beautiful Soma, I loved those different spoons in one of the picture. Loved all the pics and the curry looks so mouth watering!!! Thanks Namitha! That is a tiny stool about 18 inches long. A and me had made it quite a few years back with some leftover wood boards, then stained it rustic.. put to good use now and good for sitting too. Perfect! Loved the flavours and they are unique to the region. Beautiful dish Soma, and great pictures too! 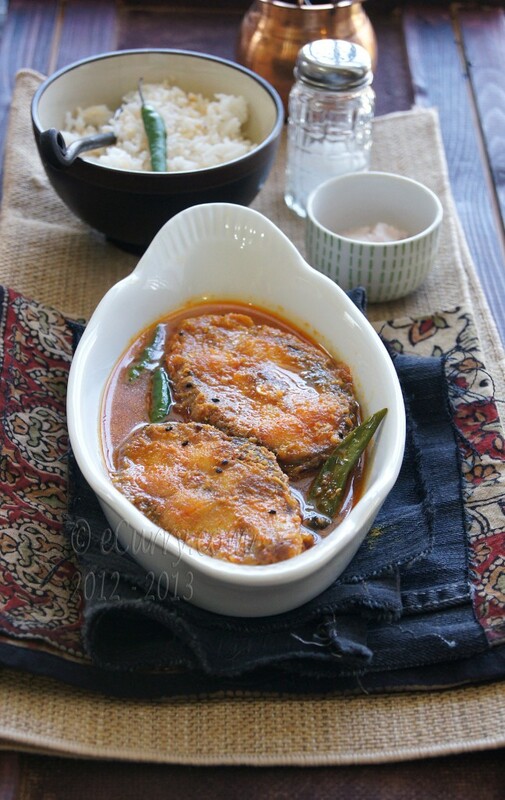 Soma, Excellent passionate presentation of simple traditional Bengali fish curry. Your opening paragraphs are always nicely narrated and full of true emotions. Wonderfully captured pictures, they very well express your memories about traditions. I Like your distinctive blogging style, loved the para where you talk about memory as passion trigger point. Thank you so much. Really glad that you have recognized the voice that always speaks inside me.. appreciate much! Ei simple fish curry ta-ke ki shundor bhabe present korecho Soma ….Where do you get such different spoons? this is a delicious looking fish. 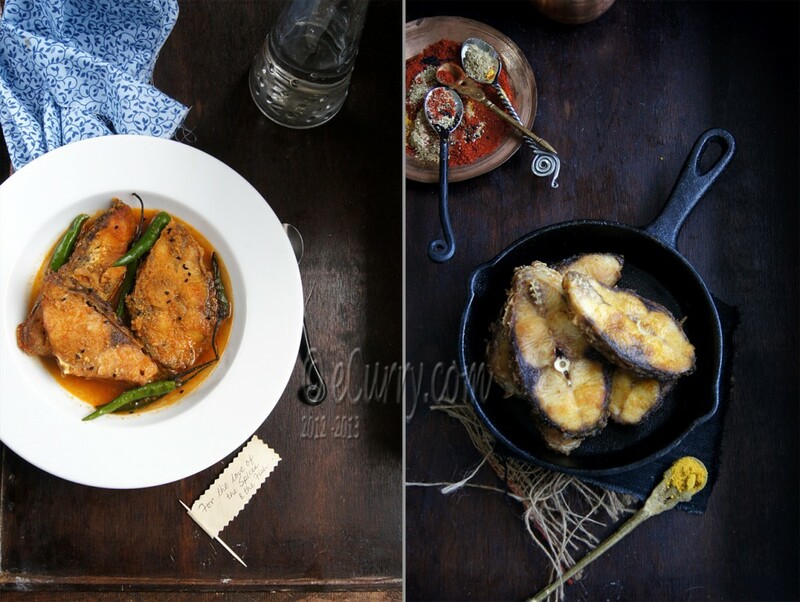 Just stumbled upon your blog – your foodphotography is amazing…gorgeous pics!! Mmmmm…..Love the look of that sauce.The curry would go so well with rice…. Nice post Soma, enjoyed reading it…The food is always tastier when its a large family sitting down to eat it…your cutlery is simply beautiful…And that maach is to die for…looks perfect ! What a presentation of such a simple recipe. Delicious. And so well presented. very authentic bangali ranna.Hunting for a piece of fish in a bucketful of jhol could mean a few broken pieces,so the maach and jhol are served separately. will be eating rui macher jhol today for lunch. Love the pictures Soma! Enjoy your time with your dad. iissh ki khete iiche hoche! Arvind will never eat if I make a fish curry this way 🙁 I miss eating such typical bengali macher jhol. 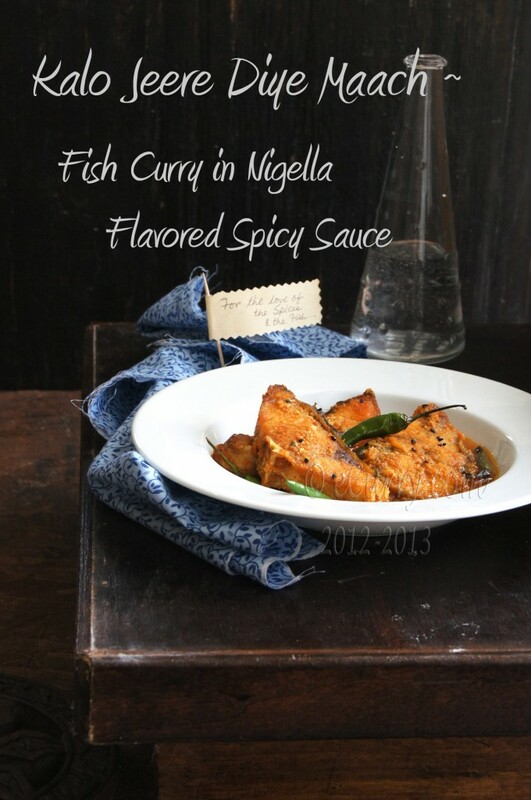 love the nigella flavor in so many things. gorgeous clicks as always! Please do drop by the Auction fundraiser to help VSPCA,India on my blog, to bid or share. Shipping is available in US, India, and some international. They are an amazing org working to rescue all animals, educate about compassion, and also help feed the poor. That dish looks lovely Soma. Love your memories too of the traditions back home. I do think it’s a shame that those old traditions die but I believe that is true everywhere around the world. That dish looks so rich and delicious!Wow…those pictures are amazing,Soma! Love mach too much! Do you fedex?